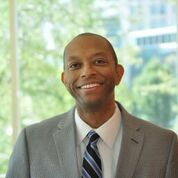 Matthew W. Green Jr. is an associate professor of law at the Cleveland-Marshall College of Law. Professor Green has taught courses in employment discrimination, employment Law, disability law and a seminar on sexual orientation and gender identity discrimination. His scholarship focuses on employment discrimination, sexual orientation and the law and workplace retaliation. He earned his J.D. from the University of Baltimore School of Law and LL.M. from Columbia University, where he was a Harlan Fiske Stone Scholar.